A fun, lighthearted story perfect for cool fall evening reading. Do you have books on your eReader that you picked up for free and then never got around to reading? Some Like It Perfect by Megan Bryce is one of those books for me. However, last week I found myself with some time to read and my Nook was dead. Thankfully, my trusty Nook app on my phone was working. I've wanted to start this book for a while and I'm glad I had the chance. I definitely in the need of a lighthearted story. I didn't know it until I started reading it, but it hit the spot. I loved the main characters. Jack is a hard-nosed CEO of a paper corporations. Delia is a painter that needs a job. And there is Augusta "Gus", Jack's half-sister who needs to learn to be an adult. The secondary characters add nice flavor to the story but their storylines felt unnecessary. Jack and Gus's mother provides some explanation to why Gus and Jack are who they are. However, I felt Justine and her boyfriend's story line was mostly a distraction, though possibly a setup for a future book. 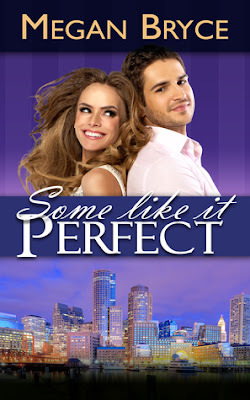 Some Like It Perfect is the third book in the Temporary Engagement series. I was a bit worried that perhaps I would need to have read the first two books, but these appear to be standalone novels, at least this one was. Maybe these characters played a minor role in one of the first two books, but I couldn't tell. The plot was predictable. Delia is hired (by Jack's mother) to to paint Jack's office ceiling. She is free-spirit. While she doesn't fully embrace the hippie commune upbringing she received, her worldview is definitely colored by it. Jack lost his father as a young boy and then when his step-father dies when Gus is a child, he steps up to be a father substitute. This is further compounded by his mother going into full mourning and refusing to take an interested in raising Gus or keeping the family company going. A lot of responsibility is suddenly thrust upon Jack's shoulders. Of course, opposites attract in this fun-loving story. I worried at the beginning that Bryce would drag out the love-hate back and forth, which with the predictability of the plot would have had me rolling my eyes. Instead, Bryce strikes the right balance in pacing the story. There is just enough buildup to provide tension but progresses quickly enough to give readers the fun, feel good story they're craving. If you are looking for lighthearted escapism, then look no further than Some Like It Perfect. And if you are like me and want more stories from Megan Bryce, you can get the first book Some Like It Charming for FREE right now.